Check it out! Amy Vega, MS CCC-SLP and IM’s Clinical Education Director, Clinical Advisory Board Director and Clinical Education Administrator shares with us the importance of focusing on a clients strength to impact training outcome. Often, the goal of IM training is to improve a person’s ability to attend to and process information more timely and accurately. IM training will be much more effective if you first explore how your client or student processes information best…is it by seeing the information or hearing it that he pays attention to it and comprehends it best in daily life? 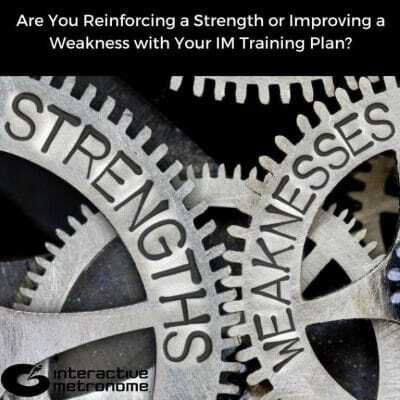 I have found in my own clinical practice, and through years of providing clinical support to IM providers around the globe, that this question is a very important one that will impact your IM training outcomes. If the individual is stronger at processing VISUAL input, then he needs to do IM via auditory training alone (without reliance on the visual cues on the computer screen for timing). If he has particular difficulty attending to or processing the Reference Tone or Guide Sounds, then the use of the Training Visuals may be helpful as a teaching tool but should then be discarded so that he can focus on learning to process auditory information. As a reward, you can bring in a game or two during your session for motivational purposes, but the lion’s share of the heavy lifting must be done via listening to and synchronizing motor movements with the auditory beat (in the absence of visual cues). If the individual is stronger at processing AUDITORY input, then he needs to do IM via auditory training first (usually doesn’t take that may sessions since it is already a strength) and then proceed to visual-only IM training. Because he is better at processing the auditory information, when the visual information is presented on the computer screen he does not really have to process it. He can still perform IM well by relying predominantly on synchronizing his motor movements with the auditory beat. By removing the auditory input, he is forced to process time visually. In clinical practice, I have found that modality-specific training focus (auditory vs visual), emphasis on repetitive RHYTHMICAL movement (see this blog post here) and leveraging Difficulty and Tempo to challenge focus and processing have been key ingredients for successful outcomes. When auditory and visual processing speed & accuracy are out of sync with each other, dysfunction results. It impacts all areas of life, regardless of age. So, before you start IM training with your client or student, ask whether the person pays attention and/or processes information best when seeing it or hearing it? Then work on the weaker processing modality by limiting input to the stronger modality (note: this may be a very gradual process). Most of you are very familiar with auditory IM training as this is what is taught in the IM Certification Course. Fewer of you have probably been exposed to Visual-Only IM Training. Several years ago, I gave two presentations that were recorded. I received this email from a parent of a child with severe Sensory Processing Disorder & Dyslexia after he participated in visual-only IM training with this OT, Christine Einboden. He had previously completed a course of IM training (auditory) with Christine, which was helpful in many ways but did not improve his Dyslexia or his ability to learn a foreign language. After Christine attended my lecture, this child participated in IM training again with emphasis on visual attention and processing. His name is Michael, and as you will see from the email below, he is obviously a very bright child with so much potential! We have been told by well-respected Speech Language Pathologists, that with Michael’s visual and auditory problems, that probably (are in part) the reason his Dyslexia is so severe, we can never ever expect him to be able to understand or learn any foreign languages. For college, he will need to provide proof of the severity of his dyslexia, and he could possibly learn sign language, as his only foreign language. But…but Michael wants to travel to other countries, as part of an expeditionary team, and wants to be able to speak other languages, at least effectively enough to find his way around. So he has been distressed, that he would always need a translator or guide. A couple years ago, we tried a few beginning lessons in Latin American Spanish, and he couldn’t get it at all. None. Nada. Zilch. Hated it. This week, we decided to try again, and chose Rosetta Stone, which is an auditory and visually based immersion curriculum. We started with Latin, because he is already learning some Latin, in his field of Entomology, and because I (having taken Latin myself) knew learning the root form of Latin, could make any Anglo based language feel “familiar”. He jumped into the program, and completing the first lesson, learned 15 words, and 12 phrases, and loved every minute of it. These formerly severe challenges now appear to be (crossing my fingers, toes and eyes) learning strengths. He scored 93% on the first try, lesson one. I was just floored. He was grinning and saying: “Piece of cake, Mom!” Our plan now is to do a curriculum year (however long or short it takes him to complete that) in Latin, then do a year or two of Latin American Spanish. Since he is doing this from home, he can pace himself. What he is looking for is fluency, so he can converse, and the ability to read it as well. This is major to him, and best of all, he believes he CAN. So, wow….Ahhh, is it possible, as I think it may well be, that the improvements we saw during the Visual Only IM, is now contributing, or even the cause of this new ability? His capability for sustained attention has continued to increase, and he is able to stay focused amid competing sounds and activity all around him. Take care, Amy…we think of you often and are so grateful for the work you have done, and Christine’s patience and efforts, that is enabling my Michael to succeed in areas he could only dream of before now. Michael has NOT done any other programs since the Visual Only IM. And of course, you have my permission to share the updates. Your cause is noble and can help so many people. I will be forever grateful to you. It is exciting for all of us, and Christine has been there to see some of these changes. We look at each other all wide-eyed and say “Can you believe that? !” LOL Oh, I wish you had known him before when everything was so bleak, so sad, so hopeless. It gives us this perspective of where he started and how much progress there has been. Amazing! He’ll be 11 in a couple weeks, and it feels like the whole world and all the beautiful things in it are open to him now. I am just the luckiest Mom alive to be able to share this journey with him. He is still such a “normal” kid, whatever that may mean…since he is homeschooled he hasn’t been exposed to drugs, alcohol, or violence. Thinks kissing a girl is yucky and you could get cooties. He builds his tree fort, works on his go-cart, raises chickens and rabbits. Has friends of all ages. And learns, every day. One of our last challenging areas is Math. I am looking through different Math programs, trying to find one that uses his learning strengths, to understand Math concepts. He can understand higher level concepts, but it’s the basic “math facts” he just can’t memorize. Math on paper makes no sense to him, although Math in real life, like cooking, measuring, building, real-life applications in Math, are easy for him. So, I am telling you this, because you just might have an idea, or know someone who may advise us, on a good hands-on multi-sensory program that we can try.”Thank you so much!